Since its inception, Bayreuth has become the byword for innovative and daring productions. 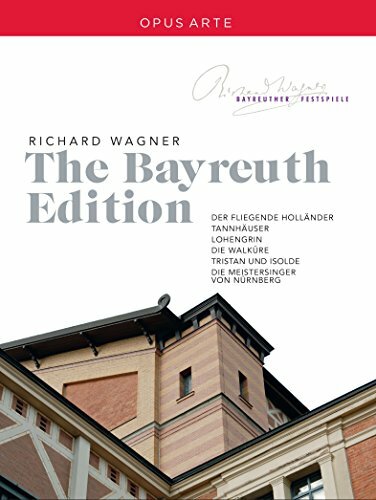 The six operas featured on this release are certainly no exception; showcasing the original sets, creative productions and outstanding singing that the opera house is famous for, they cement Bayreuth's worldwide reputation for nurturing raw talent, constantly striving for innovation. Jan Philipp Gloger's controversial production of Der fliegende Holländer is conducted by Christian Thielemann, 'Germany's most sought-after conductor' (Daily Telegraph), while Axel Kober takes the helm in Sebastian Baumgarten's thought provoking production of Tannhäuser, which casts the opera as one giant experiment. Die Walküre stars up and-coming singers Johan Botha and Edith Haller, both praised in the German press for their standout performances. The radical Tristan und Isolde sees Christoph Marthaler setting the romantic opera in a Communist-era reception room, unencumbered by the traditional lakes and forests, instead more like a psychodrama of the 1950s. Concluding the six operas is Katharina Wagner's debut production: Die Meistersinger von Nürnberg, the first ever live recording from the Festival, praised by Opera Canada for its 'stunning theatrical spectacle'. Richard Wagner's operas find their home at Bayreuth, and these six very different but equally compelling performances capture the spirit of the German composer perfectly. If you have any questions about this product by Opus Arte, contact us by completing and submitting the form below. If you are looking for a specif part number, please include it with your message.